We would like candidates who participated in the exam today April 13th, 2019 to share some of the questions they came across during the examination. Please note that the purpose is to create a forum for deliberations and finding solutions to the questions since they can now be termed JAMB past questions. This thread is specifically to share actual questions that came out today13th April. Don't start posting list of several past questions you copied somewhere on the internet or the so called JAMB expo flying around social media. 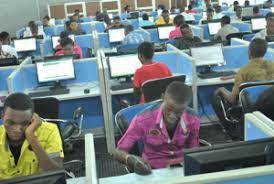 READ ALSO: JAMB 2019 UTME 13th April - Live Updates! Hello my Friends------------ I want to inform those that are writing there JAMB on tuesday are the luckiest people. boscoboy: dagosa how did you know? shedrachmorganonah: Bros.Collect your money back. Adam Dean Muhammad: Mondayanthony,.........we both got the scary same questions. WasiuTajudeen: Pls somebody should help us with literature and Islamic study question. joyce: i wrote on 13th. english passage was abt" dictionary word". Excexl: GATT means General Agreement on Tariff and Trade. Why did Akin's teacher called him a jerk? (1)Economic :which of these business is the oldest(q,sole proprietor,b partnership,c limited liability company, d Co op. How many page does letter that Aliya father sent to her consist of,ans=16". (2) Aliya mother occupation is, ans =nurse. (4)"eat up all for free, ur forefathers had paid for it "what did phrase above teach us, ans =hmmmmmmmmmm.there's a lot that I could remember. Just go through the past question. Pls Those that where not opportune to know there own should not be jealous. Akintolani: My Sister wrote her Jamb Exam on Thursday dated 11th day of April, 2019. I wish her best of luck, but when i read that those writing on tuesday are the luckiest i felt some how, i wish all the jamb candidate best of luck. Bro., thanks for the update. I did my exam on 13th April 2019 @funlearn mind builder opebi Ikeja 01: 30pm.. I Did My Exam Yesterday, For Government Students make sure that you read BASIC CONCEPTS OF GOVERNMENT which include POWER, AUTHORITY, LEGITIMACY, SOCIALISM etc. and also read TYPES OF GOVERNMENT, BASIC PRINCIPLES OF GOVERNMENT, PUBLIC ADMINISTRATION which covers LOCAL GOVERNMENT, PUBLIC CORPORATIONS, THE CIVIL SERVICE. and Pre - Colonial Administration In Nigeria, And International Organisation. My opinion? Well, you all should go and study well. You see, it took jamb 1 whole year to prepare this exam, that should be enough time for them to set different questions, categorize them for different day and batch them into several time intervals (if you catch my drift), so the likeness of the question that comes out on 13 to appear on 15 is very few. The only set of people that I believe can get their questions repeated are those that did it on the same day, let's say those that did theirs at 7am are like to have their questions repeated for the doing at 9 or 1am but shuffled up. This is just how I see things o and as far as I've been reviewing peoples comments here, I didn't come across any of the questions that posted here in my exam(non that I can think of). * Why did Aliya hate being called a child? It Was Successful To God Be The Glory!! !